I'm trying to get my head around the concept of "First Ladies" holding such incredible cultural and commercial influence; the superWAG if you will. This is less because of the ladies themselves, most of whom do an exemplary job, and more around what it stands for as something to emulate. Women who make it to power in their own right are habitually ripped to shreds by the media, while these mostly-mute, standard-bearers for whatever their particular establishment wants to project are exalted to a saintly position. Why are people so much more comfortable celebrating a woman whose status is indexed solely to that of her husband? Behind every great man - well, the 'couple-as-a-team' - is a positive aspect, and something delicately navigated by Michelle Obama (who ain't no candyfloss herself!). But no matter how many healthy eating programmes she promotes and charities she founds, the lion-share of the column inches celebrate her toned arms and new fringe. 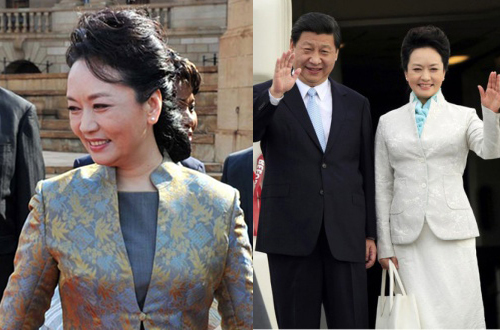 The latest member of the First Ladies club Peng Liyuan - wife of China's new President Xi Jinping - has already caused a sell-out tsunami of every piece of cloth she drapes over her elegant shoulders. This is a first for China as wives of the men in power have traditionally kept a very low profile. Peng is a famous singer in her own right and I'm interested to see whether she breaks the mould, or suffers the puppet-like censorship fate of most under the current regimes (both Chinese and the even more tyrannical world media). It's a tough path to navigate but Peng is already a U.N. ambassador for health, and might even be giving a speech on AIDS during an upcoming trip to South Africa. It'll be fascinating to see if she breaks through this traditional barrier, transforming the top first lady position into something more meaty. Let's see the column inches dedicated to real achievements rather than the cut of her collars.